1. It's easier to get to from Heligoland (in the right conditions). 2. You avoid travelling (and crossing) the River Elbe with all its traffic and strong current. 3. You avoid the massive ship lock at Brunsbüttel where we have heard of yachts having to wait as long as 4 hours out in the Elbe before locking in. There are some issues with the locks and they are not all operating. On Wednesday we moved on to Friedrichstadt, just 10nm further on, a pleasant short trip with withies to mark the shallows and bird life to entertain us. Porthand withies with brush pointing skywards and red tape as we'd seen in the Wattensee, and starboard ones with brush lashed downward. A highlight for me was 2 avocets marching along the water's edge, feeding with their long curved beaks in the water, heads swishing from side to side as they went and ignoring our passing completely. The river is still tidal at Friedrichstadt but there's a lock off the main channel so the level inside doesn't drop at low water. I paid our lock dues in the office up 2 flights of stairs (€14 for in and back out), took a photo from the high lock gates, and then we found our way through the trees into the small old harbour. Not as pretty here, just a pond next to a busy road, but the other side of that road is a town built by Dutch folk which lures tourists with its nickname "Kleine Amsterdam" Hmm! 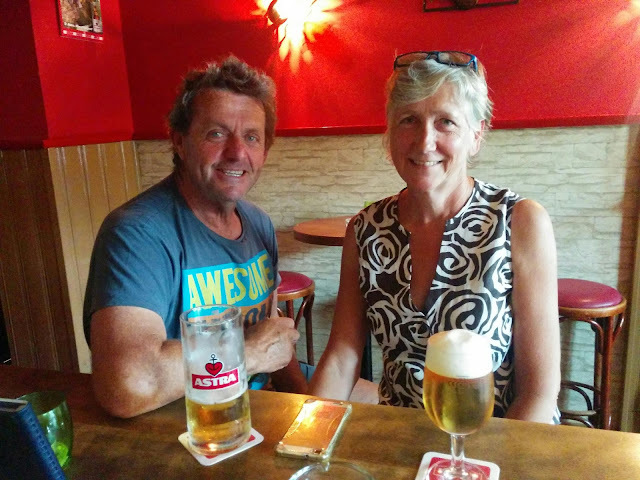 Luckily we found a good little bar and when we'd finished arguing about Brexit with a friendly German airman, we returned to Bonify to barbeque in the rain. 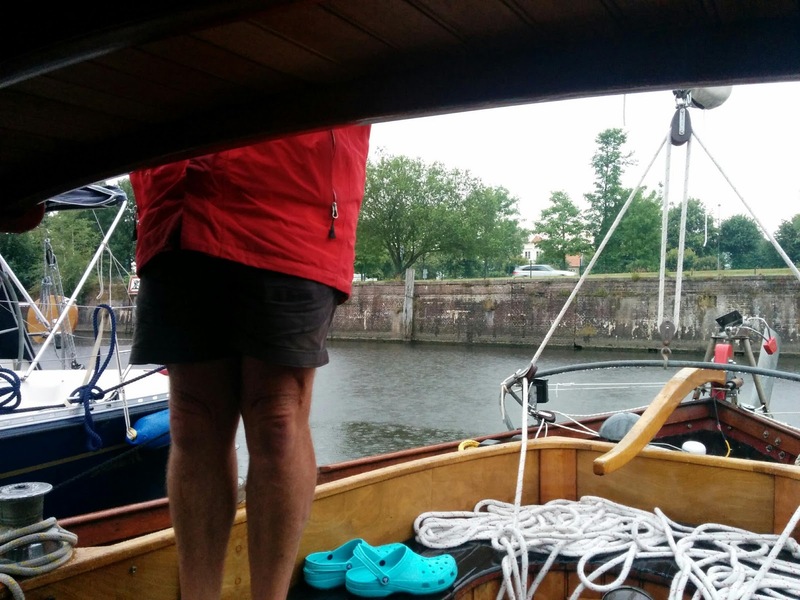 With the rain set to continue we stayed another day in Friedrichstadt. With the benefit of hindsight we'd recommend that of the 2 places Tönning is the nicer spot to lie though we did rather like the Friedrichstadter Pub and went back for another session. We are indeed happy and relaxed. Sorry it took so long to publish your comments, I'd forgotten that I had to do that. Lovely to get comments, thank you.